e-Chat is a beloved decentralized messaging app that is highly appreciated by millions of users worldwide. 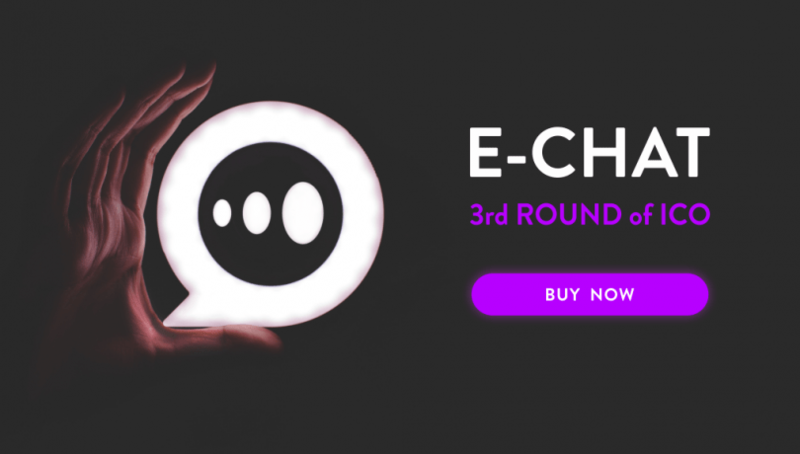 Since October 2017 e-Chat team has been running ICOs and the launch of the Third Round, and at the same time, the last one is scheduled on January 8, 2018. The coming ICO brings many surprises and one of them is the flexible system of discounts throughout the whole ICO period. No need to explain that the earlier you jump into investing and supporting e-Chat first decentralized messaging platform, the bigger discount for 1 ECHT (e-Chat token) is provided. – Throughout January 8-15 you can purchase 1 ECHT with 30% discount, for $1.05. – From January 16 to January 21 the price for 1 ECHT is $1.125 (25% discount). – January 22-31, the discount is 20% and the price for 1 ECHT is $1.20. – February 1-8, 1 ECHT is sold for $1.275, with the 15% discount. – During February 8-15, the discount is 10% and the price for 1 ECHT is $1.35. The app has a couple of very strong features. First of all, the Blockchain background makes it extremely safe and protected. Secondly, e-Chat is a very bold attempt to combine the two spheres: social and financial because it’s the messaging platform with the inbuilt crypto wallet enabling instant financial transactions between the users of the app. Thirdly, the e-Chat team has introduced the function of crypto like that gives users the opportunity to support the content they like, going through the news feeds of others. Apart from standard functionality embedded in the app, the e-Chat team keeps making the app better. In a very short period of time, the users will get exposed to the new design of the app. Be among the first to have a look at it, click here. You are welcome to download the application on Google Play or App Store. Highly skilled e-Chat international management team keeps welcoming new advisors. All of them are experienced entrepreneurs running companies and projects of their own. They have clear visions of how to nourish and support startups and projects based on the Blockchain technology. Please, follow e-Chat newsfeed to get to know all new coming advisors and team members joining the project. Disclaimer: The opinions expressed in this article do not represent the views of Networking Eye or any of its team members. NetworkingEye is not responsible for the accuracy of any of the information supplied in Sponsored Stories/Press Releases such as this one.